Conversion to 64 bit application from (32 bit / Any CPU) causing application to throw error. I am using VS Enterprise update 3 - 64 bit version on Windows server 2008. The Issue I am facing is that when a web application created in platform 32 bit changed to 64 bit, the applications fails runnung. By following these steps with no code added causes the following error. Once the project is created, right click the project and navigate to Project properties and goto Build tab. run the application to get this error. Could not load file or assembly 'DefaultTest' or one of its dependencies. An attempt was made to load a program with an incorrect format. Exception Details: System.BadImageFormatException: Could not load file or assembly 'DefaultTest' or one of its dependencies. An attempt was made to load a program with an incorrect format. Re: Conversion to 64 bit application from (32 bit / Any CPU) causing application to throw error. The error is basically referring to a x86/x64 process/assembly mismatch. You're having a 32-bit / 64-bit conflict. It sounds like your main project might be set to 32-bit while the class its referencing is set to 64-bit. Change the value for Platform Target on your web project's property page to Any CPU. (1) In visual studio ,open menu "Tool" > "Options" . (2) Choose "Projects and Solutions" > "Web Projects". 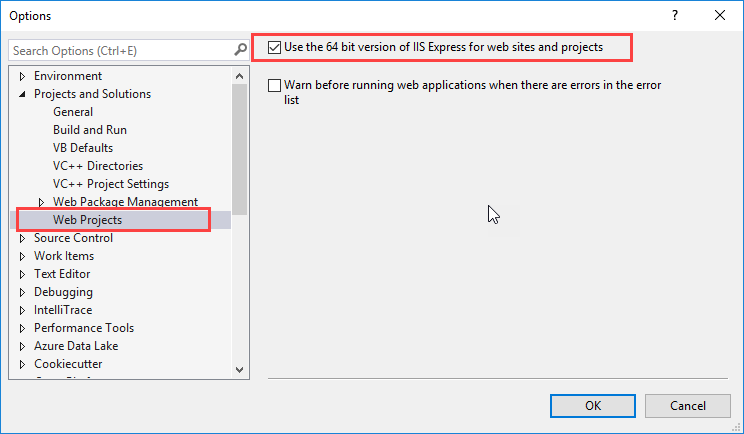 (3) Checked the option of "Use the 64 bit version of IIS Express for web sites and projects". 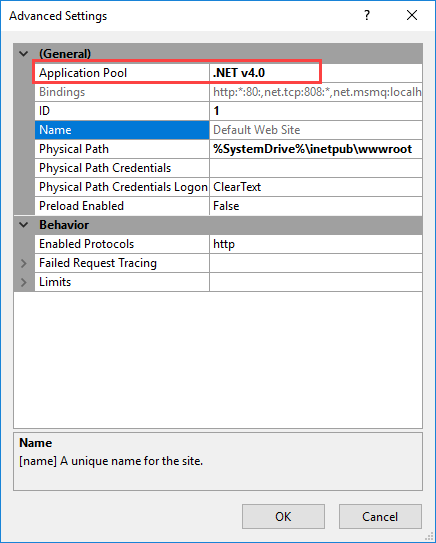 If you site had been deployed on IIS , you could refer to the following link. (1) You could find which application pool your web application using ,right click on your web application ,choose "Manage Web Site" > "Advanced Settings…" on the menu, then could find the application pool which your web application using in the dialog. 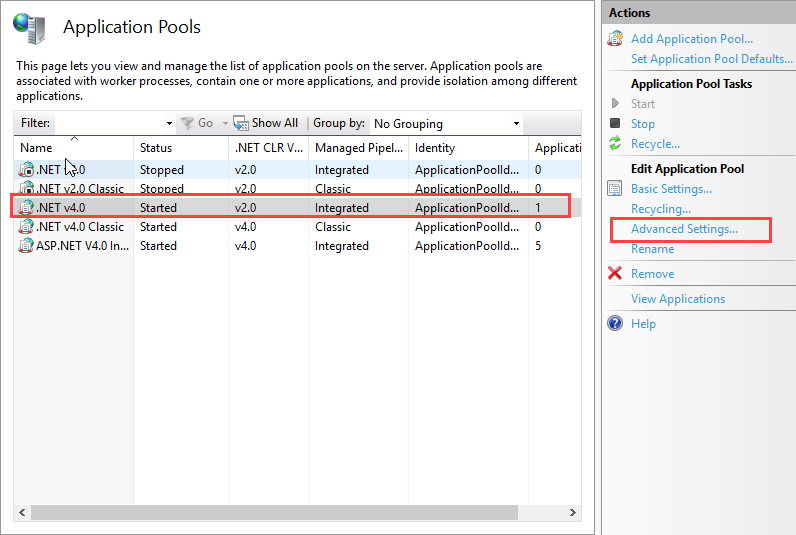 (2) Find the application pool in application pools ,then click "Advanced Settings…". 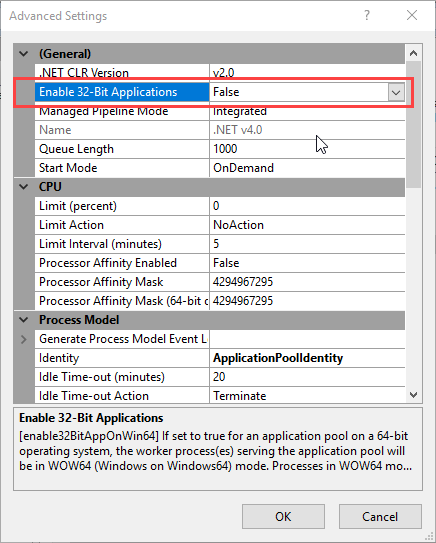 (3) Set the option "Enable 32-bit Applications" to false.